Cecil King, RI RBA ROI RSMA (1881-1942). Watercolour, signed and dated 1919 Cecil King (LR). 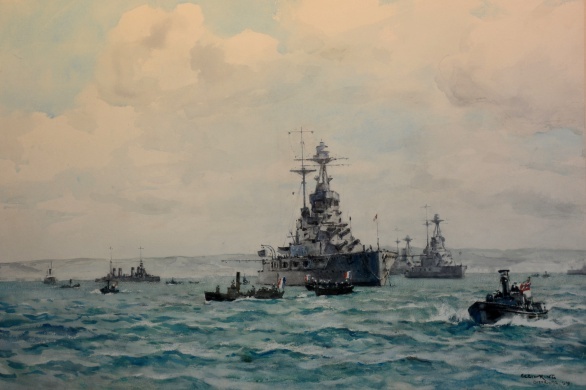 HMS BARHAM (Captain Richard Horne DSO RN) wearing the flag of Vice Admiral Commanding 5th Battle Squadron, Vice Admiral Sir Arthur Leveson KCB, paid a visist to Cherbourg in 1919 and the watercolour is full of small craft from both navies darting around the capital ships as they lie at anchor: a French battleship, left background, is in company.